Microsoft has outlined its launch plans for the next version of the Windows operating system, codenamed Windows 7 (formerly Vienna). The launch date was revealed at a field sales conference held last Thursday. The company apparently told executives there that Windows 7 (its own internal name for the product) would launch within three years. Microsoft is keen to create a cast-iron release schedule following the protracted delay of Windows Vista , which arrived in January 2007 - five years after the launch of Windows XP . Microsoft has been criticised, particularly by businesses, for not setting a roadmap for the launch of its operating system. It now plans to be more open and drip-feed information about new versions of the operating system to its customers and business partners. 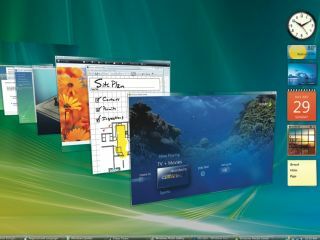 Like Windows Vista, Windows 7 will be available in separate 32-bit and 64-bit versions. A subcription-based version is also likely. "As part of our ongoing outreach to enterprise customers and partners, Microsoft has begun sharing plans for how they will continue to deliver value to businesses in the future... Software Assurance customers in particular," a Microsoft executive told ZDnet . "Microsoft is scoping Windows 7 development to a three-year time frame, and then the specific release date will ultimately be determined by meeting the quality bar," according to the representative.